Trips to the farmer’s market are extra rewarding this time of year. While walking home with bags full of fresh, local food, feelings of gratitude abound. Remember, fresh tastes best! Cherries and blueberries tickle your taste buds and are known to benefit your health in the following ways. Cherries are a rich source of antioxidants and contain compounds (queritrin, ellagic acid, perillyl alcohol) that help fight cancer. Cherries help you get a good nights sleep, something we all need. Their anti-inflammatory properties relieve pain from arthritis and gout and help alleviate migraine headaches. Blueberries, another antioxidant powerhouse that provides anti-cancerous benefits, are great for your brain, eyes, and cardiovascular system. Both fruits are low in sugar, but high in nutrients, a winning combo. If I could only consume cherries and blueberries when they’re in season I would not be a happy camper. Therefore, I freeze a substantial amount so I can enjoy them year round. Click here for video instructions on 4 ways to pit a cherry. What are some of your favorite smoothie worthy local foods? If possible, I encourage you to either add or substitute a local fruit into this recipe. The kefir I used in this recipe coupled with frozen blueberries provided enough thickness. Use frozen fruit and/or ice to achieve your desired consistency. Enjoy! Place all of the ingredients into your high-speed blender and blend for around 30-45 seconds or until nice and smooth. If you don’t have a very powerful blender and your coconut oil is in liquid form, you might want to blend everything except the coconut oil first, then drizzle it on and blend for another 5-10 seconds to avoid clumping. 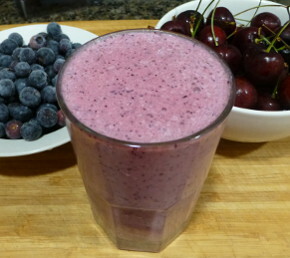 I would love to know if you try this cherry blueberry smoothie – please leave a comment below. Happy Blending! I made this for breakfast, and loved it! Thanks! Tried this smoothie this morning, for breakfast. It tastes gorgeous, but I added half an avocado and used most of the add ons. I don’t think this would sustain me for long enough otherwise. If following the recipe exactly, it would make a wonderful summer drink or great for ice lollies. Thank you, Ryan. I like how you adjusted the base recipe to meet your needs. That’s what I preach over and over :) You’re right, without the avocado and add-on’s it wouldn’t sustain me for very long either. Can’t go wrong with ice lollies. Looking forward to trying these recipes.